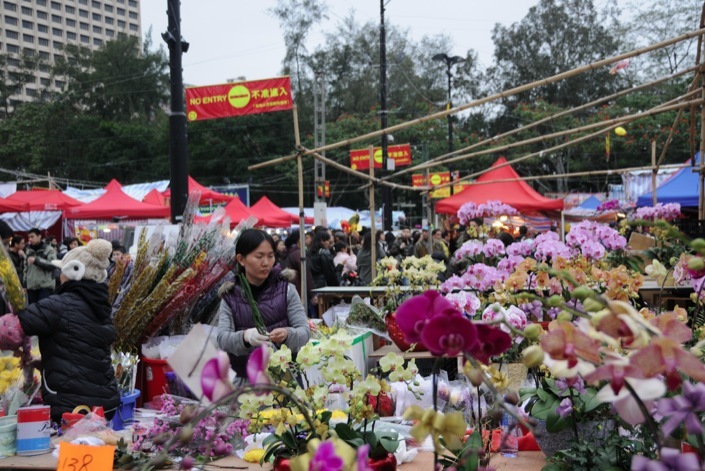 Flower markets are a Chinese New Year tradition and of course, we had to visit the largest and biggest one in Victoria Park, Causeway Bay last Sunday, the final day before Chinese New Year. We arrived in the afternoon, and it was already packed and crowded. There were a couple of rows to choose from, we walked through the two on the south side, which were filled with flowers (we were not hungry or in need of cheesy toys). 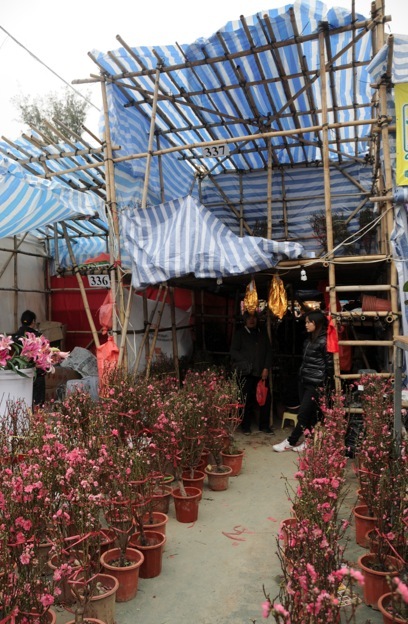 For the Chinese New Year, flats and houses are given a deep clean and flowers are being bought as a decoration, as well as a gift when visiting family members and friends. 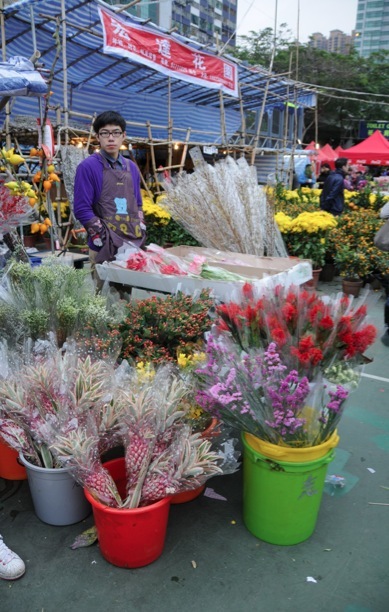 To Chinese people, it is important that the arrangements are very colourful, especially in red and yellow. But we’ve seen lots of other colours too (even blue and purple blossoms, which had clearly been coloured with coloured water). 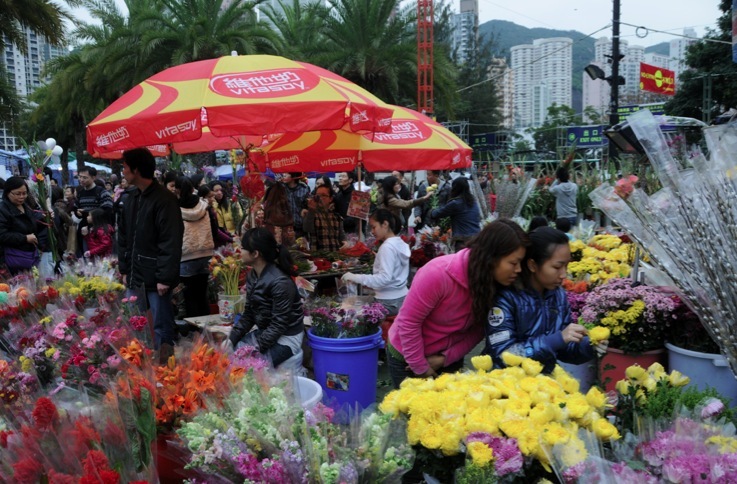 Chinese people were busy shopping and haggling for flowers. 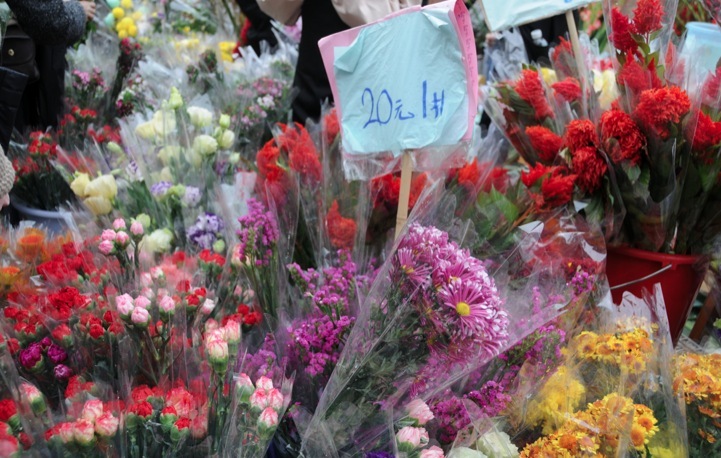 As it was the last day of the flower market, a lot of people were hoping for a bargain, trying to drive the price down as much as possible. 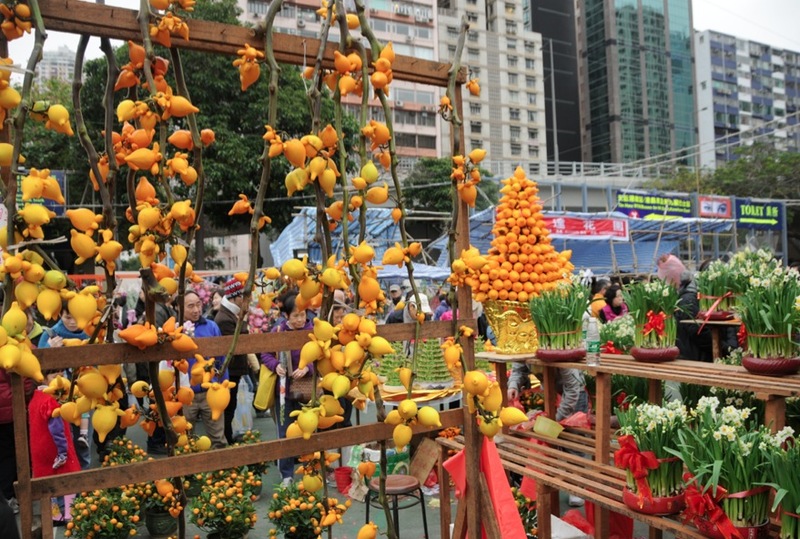 One of the plants that is typical for Chinese New Year is solanum mammosum. Don’t worry, I did not know the name, I had to look it up too. It is commonly known as Cow’s Udder because of its form and it poisonous. 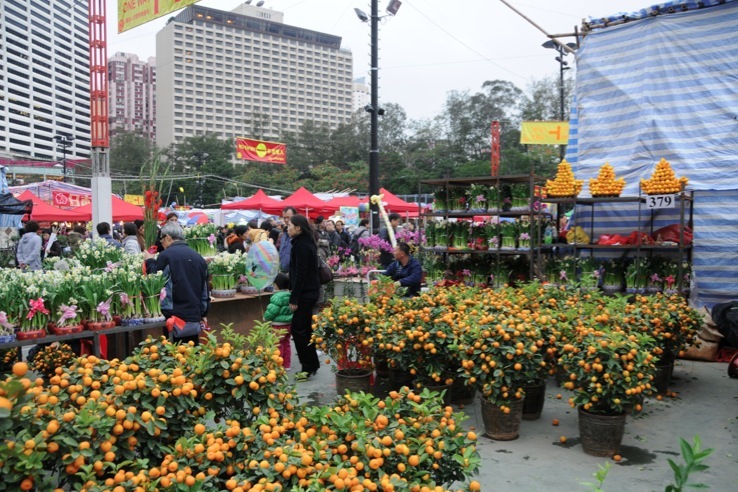 Nonetheless, this plant, together with the tangerine tree and the orchid flower forms the classic Chinese New Year trio present in almost every house and office building. Solanum mammosum is a poisonous fruit is native to South America and is grown for ornamental purposes. 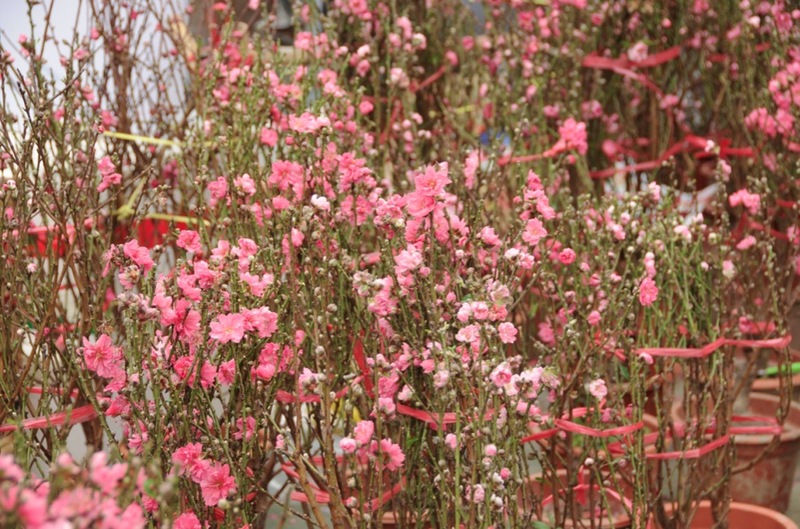 imported to Taiwan and Hong Kong as decorative foliage for use in religious and festival floral arrangements. 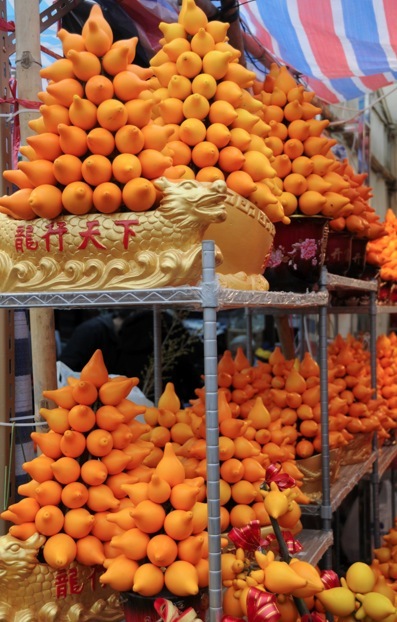 They are commonly used in building Chinese New Year trees due to their auspicious golden coloured fruit. 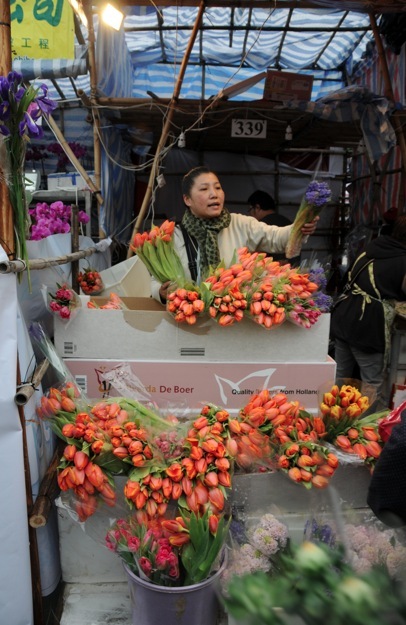 Of course, the classic tulip (imported from Holland) is also available. 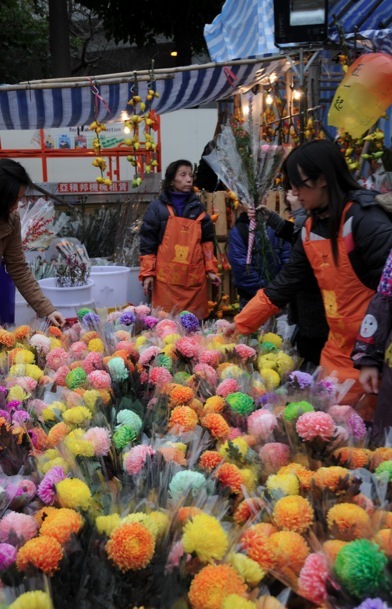 But judging from this empty booth it was not that popular – clearly Chinese people thought it was too boring, as they opted for bright pink, blue and purple chrysanthemums instead. Plum blossoms (at least I believe they are plum blossoms) are very beautiful to look at – and of course, are also being sold at the Victoria Flower Market. People put them up in their homes or in offices and decorate them with red envelopes. 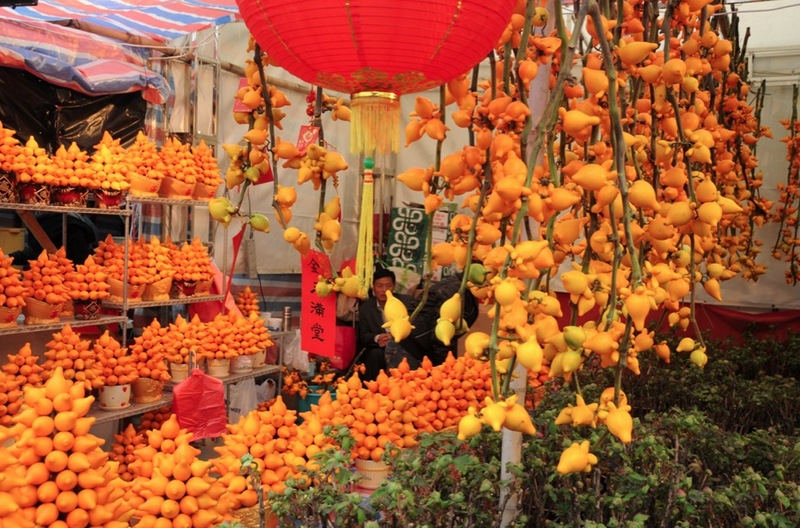 The Chinese New Year equivalent of the Christmas Tree is a tangerine/kumquat tree, with the bright orange fruits believed to bring luck and the tree itself believed to be auspicious for wealth in the new year. 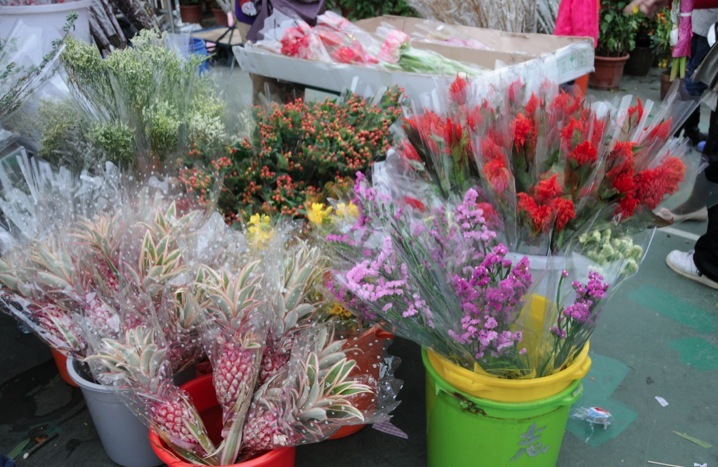 Flower markets are stacked with them. 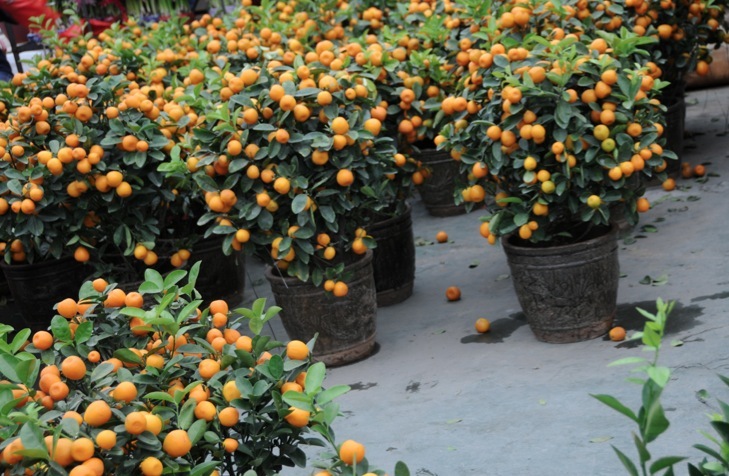 They are surprisingly affordable – we saw tangerine/kumquat trees for 200 HKD (20 Euros) but because we would have to carry them on the tram, the ferry and the bus back to our flat in Discovery Bay, we decided to look only and purchase nothing. 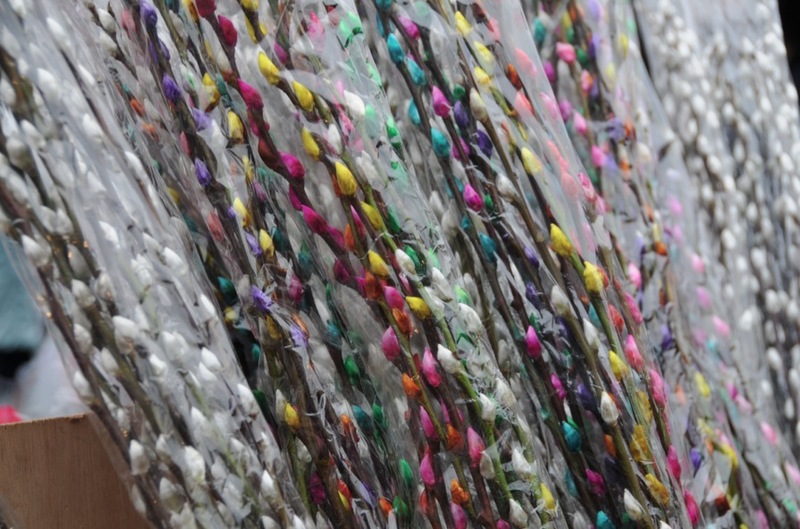 Coloured willow catkin seems to be popular too – but again, too cheesy for my taste and too difficult to carry home. So again, we said ‘thanks, but no thanks’. 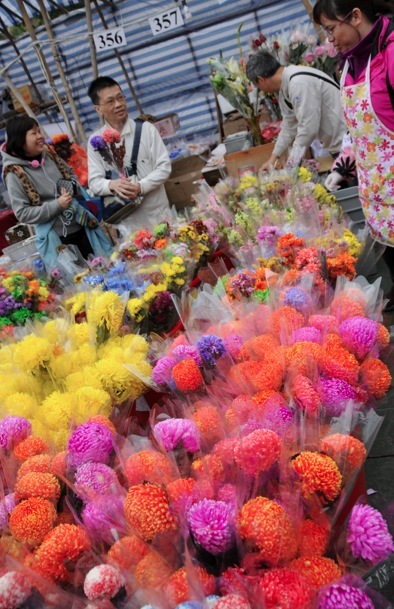 After stalls of colourful flowers – in the brightest neon-colours – we had to agree. Flowers don’t look nicer just because they’ve been kept in coloured water. Please leave them in their normal colour, no need to colour them artificially! 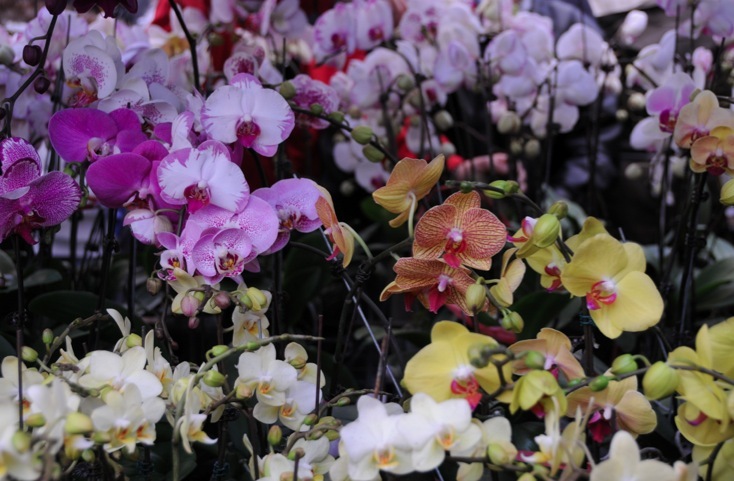 Finally, we arrived at the rows and rows and rows of orchids. They were fantastic to look at. 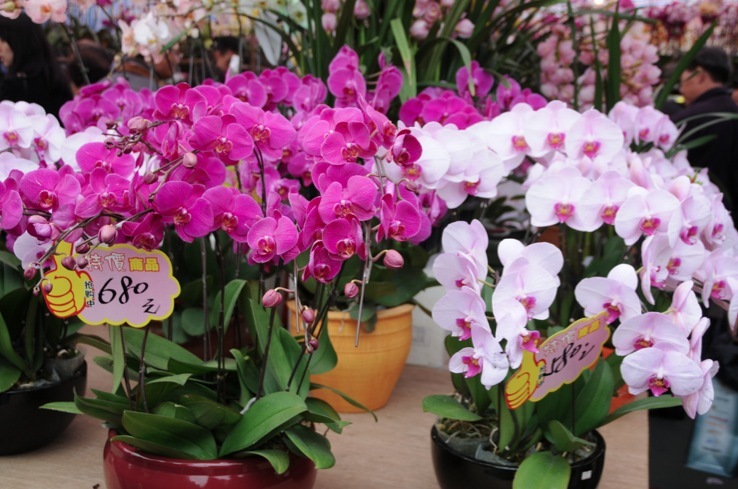 Not only the different types, from miniature ones to large ones, but also the different colours. They were really expensive, but of course, also really nice. 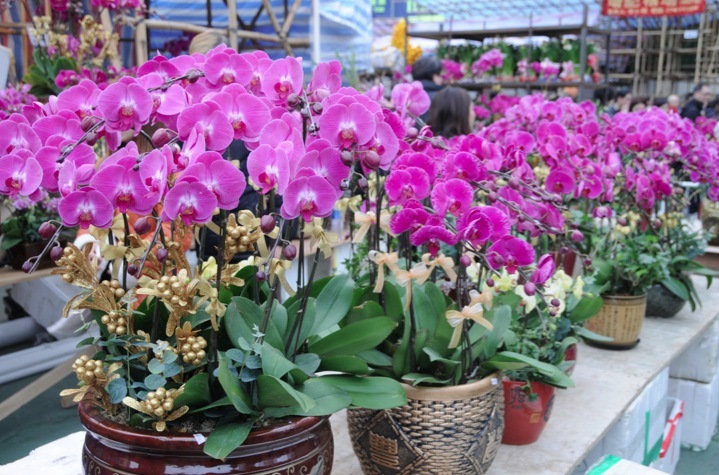 Small ones started from 60 HKD (6 Euros) bargain to big ones with many orchids in one plant pot going for 2,000 HKD (200 Euros).